In 2011, Athletes World created a new brand identity to promote a consistent and unified look across all sport shops. The new brand name, “AW LAB” is easy to remember and the logo is a distinct and recognizable icon. AW LAB strengthens the connection to younger generations and the digital world. Along with the abbreviated name, a new slogan was created, “Your Urban Style Refresher”. “The reason for the change was the need to increase customer communication. By using innovative media we want to increase customer loyalty, improve communication and create additional sales,” says Rocco Carena, AW LAB Marketing Manager. 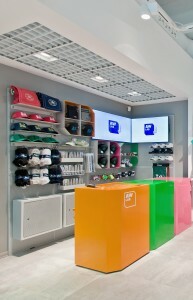 Part of the restyling was to include digital signage into the sports shops. As a full service company, M-Cube was selected to implement the changes using the Scala digital signage platform. The refined in-store customer experience includes digital signage and in-store radio. Screens are positioned in the shop window and behind the counters. The in-store radio plays music and provides information about different products. This allows AW LAB to communicate in an innovative way while improving brand consistency across all stores.75 AW LAB retail stores have already transitioned to the digital experience. Several digital screens were installed at various locations. Two 46” Samsung portrait screens were installed at the shop window and two 46” Samsung landscape screens were installed behind the counter. M-Cube also manages the content of the entire network by using Scala Content Manager. AW LAB’s objective is to use its range of features, such as quick updates on multiple channels, to augment the communication capabilities for in-store clients. Flexibility and stability are also key aspects of the Scala platform. Content is updated weekly at all AW LAB shops and consist of product promotion videos, Partner’s TV adverts, branding videos, live events and lifestyle videos to support in-store marketing campaigns. Since the opening of the new AW LAB stores, an increase in store traffic has been noticed. AW LAB’s objective is to complete the restyling of all Athlete World stores within 2014.